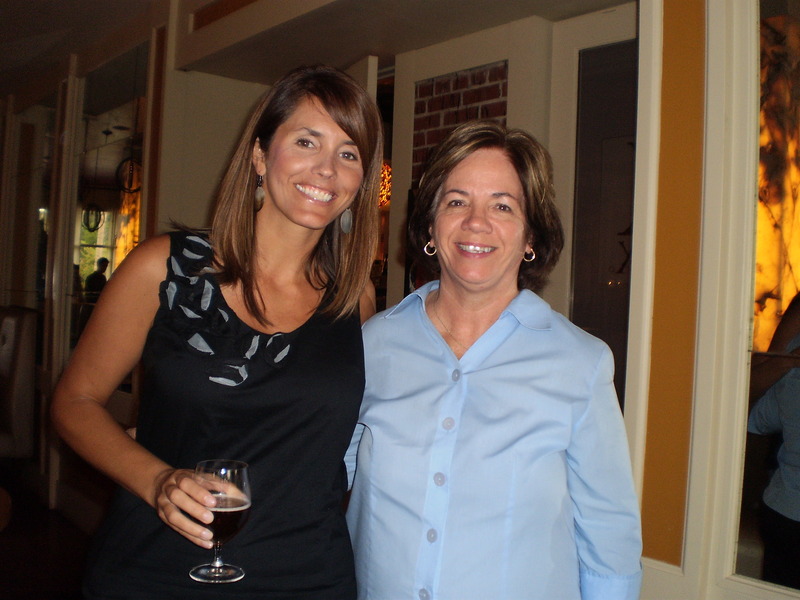 Gluten-free Wine Dinner at Bistro AIX was AIXtra Special! 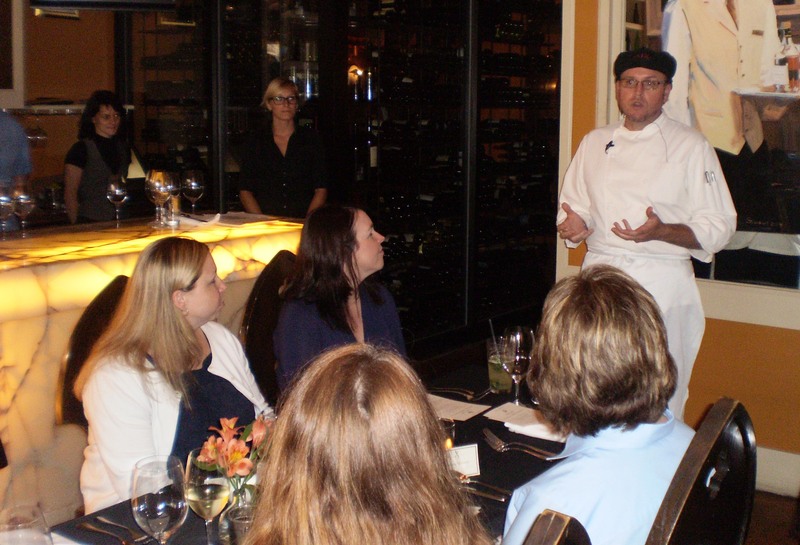 Last night we hosted a gluten-free wine dinner with Bistro AIX in San Marco. This was our second gluten-free dinner this year and I would say we are two for two. Bistro AIX has a great reputation and is known for using local fresh ingredients. They are also known as a great local restaurant that can provide you with a gluten-free dinner any night of the week. In addition to gluten-free they can accommodate many food allergies and they take them very seriously. 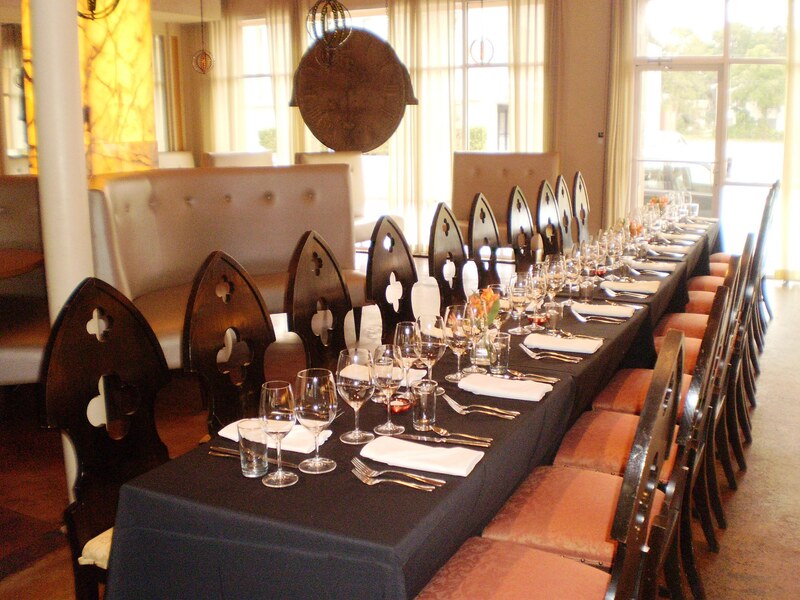 About 20 people attended the gluten-free wine dinner in the Bistro AIX Onyx Room. The tables were set very eloquently and the layout was conducive to lots of conversation. 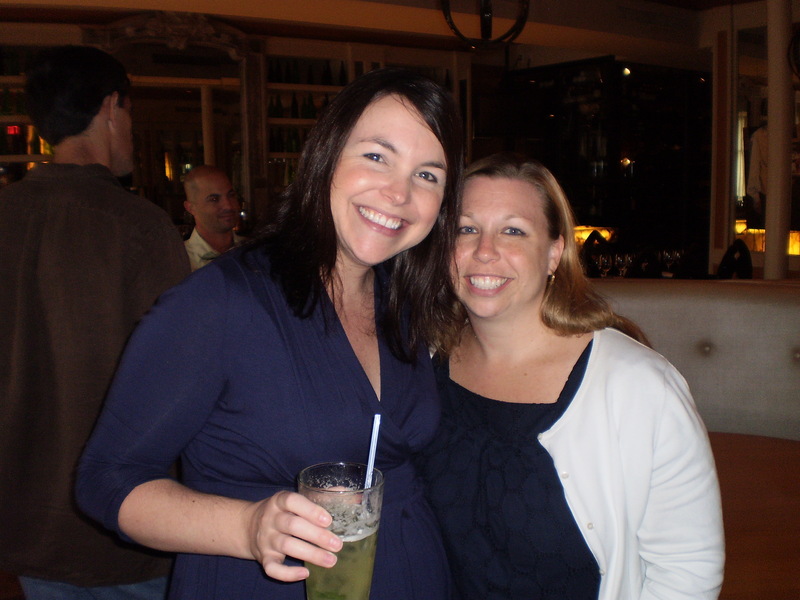 The night started off with a gluten-free beer welcome reception. The beer of choice was Bards. My mom, who has no gluten allergy and eats food that has been (in her words) “glutenated” took a sip of beer and declared “it’s good.” This was the first time I have seen my mom take a sip of beer ever in my life. My friends Jessica and Heather joined us for the evening and I was so happy to have them sit close by so we could chat about food, friends and food. Following the beer welcome reception, Chef Tom Gray very courteously encouraged us to get started. He told us a little about what was about to happen and thanked Native Sun for the gluten-free beer and advice. I was very happy to see that Native Sun got involved. They are such a great local resource and they offer many gluten-free options, including a designated gluten-free bakery. The first course was a local grape tomato and watermelon salad with micro basil and a parmesan crisp. My first reaction was “what a crazy combination”… until I took a bite. WOW. 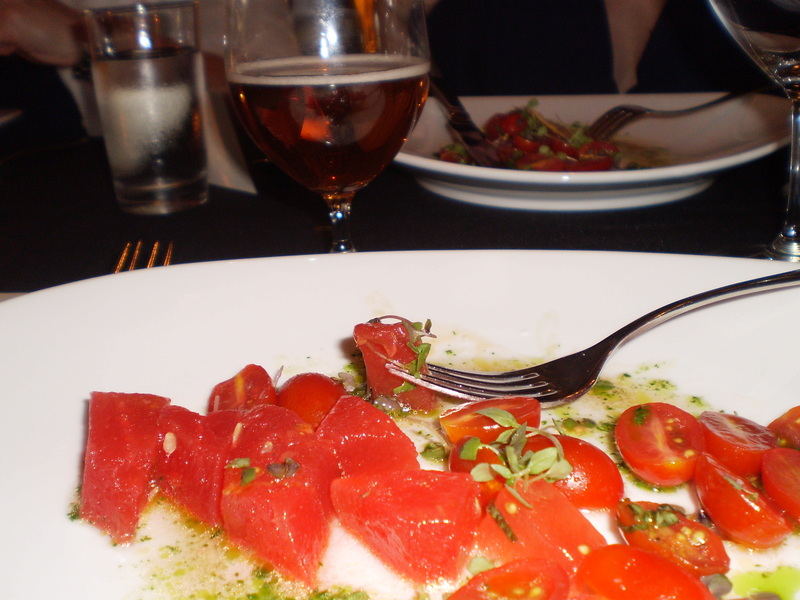 The micro basil (which looked like small sprouts) was appropriately paired with the watermelon and tomato. I am not a big fan of fruit in salads (don’t ask me why) but I found myself moving the watermelon around to get more of the basil sauce on it. Recently I have begun to mourn the end of summer and this salad was the perfect reminder that summer is still here. The salad was paired with a crisp and perfectly chilled Pinot Grigio by Solo from Italy, 2010. 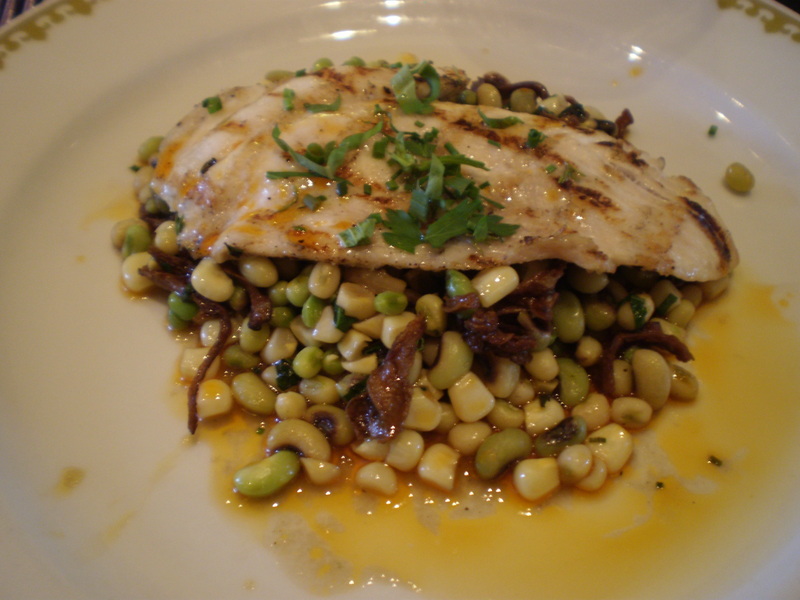 The second course was St. Augustine Trigger Fish with Chanterelles, local sweet corn, field peas and paprika butter. What are Chantarelles you ask (I had no idea myself); they are edible woodland mushrooms. They were a perfect compliment with the field peas and sweet corn. I don’t think I have ever had Trigger fish before and was pleased to find it flakey, yet firm and seasoned nicely. The wine paired with this course was CHUCKER a Cab Franc, Merlot and Cab Sauvignon Blend from Happy Canyon in California, 2009. I loved this wine, it was my favorite of the two. It almost tasted carbonated and was full of flavor without being too overpowering. Dessert #1: Ok, sadly I could not enjoy this one because the icing had dairy. But the recipe for the cake (from Gluten Free Gourmet) did not have dairy in it. 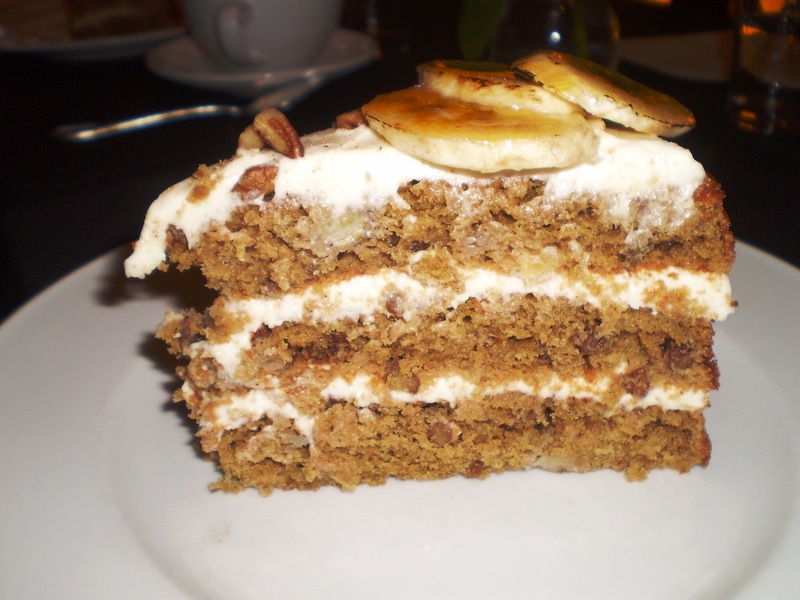 This is Banana Pineapple Cake with Vanilla Cream. This was definitely a crowd pleaser. I don’t think a “glutenator” would be able to tell that this is gluten-free. I did not see leftovers on anyone’s plate at the table. It looked like a dessert you would see in the bb’s or biscotti’s case but it was gluten-free! According to Chef Tom, this may make an appearance on their regular menu so keep an eye out. Dessert 2: this is the dessert I had because it is gluten-free and dairy free. These chocolate meringues were so moist inside. They were light as air and perfect with the Illy coffee that was poured. While I was envious of the Banana Pineapple Cake, everyone around me was curious about my dessert. I guess it is true, the grass is always greener. Thank you to everyone who attended. It is always nice to sit and enjoy food with out having to have a million conversations with the Chef, waiter or host staff about our special dining needs. We were just able to relax and eat. I also enjoyed the great conversations about restaurants, recipes, lessons learned, limitations and ideas for future events like these. Also, a HUGE thank you to the Bistro AIX staff Sarah Marie, Chef Tom, Natalia and Jerry. Another thank you to some great establishments who helped spread the word: Native Sun, Sweet Pete’s, The Grotto, Jacksonville Scene and The Jacksonville Wine Guide.